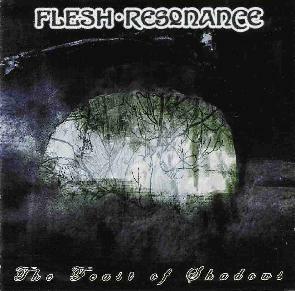 Flesh Resonance - "The Feast Of Shadows"
The Feast Of Shadows is the follow-up to UK based Flesh Resonance's The Dark Between The Stars (see AI #25). The band is the quartet of Tony Longworth on vocals, bass and programming, Andy Morris on keyboards, ebow guitar and programming, Melanie Webb on vocals, and Keith Hill on guitars, vocals, programming and percussion. Flesh Resonance describe themselves as Dark Ambient electro-rock, and while the music is certainly dark and includes elements of ambience and electronics, the atmosphere is ultra spacey throughout, with a powerful grooving dance vibe, heavy symphonic keyboards and a haunting Gothic edge. The first moments of the opening track, "Welcome Exile", took me by surprise, sounding like a freakout moment from the Space Ritual. But the band quickly launch into an industrial metallic rage with kinetic electro rhythms, sympho keyboards and haunting voicings. Like a heavy metal space rave. Other highlights include "Reflections & Shadows", a beautifully dreamy space-pop tune with gorgeous atmospherics and melodies. "In The Wake Of Eternity" is one of my favorites, being a killer blend of Ozric Tentacles, heavy proggy keyboards and Goth. "Let Go The Soul" and "Spectral Reality" are both short transitional tracks that have an 80's Hawkwind sound to them. Another favorite is the 8 minute "Worlds Within Worlds", with its cosmic blend of industrial aggression and seductive melodic dreamscapes. And "Reaper" is yet another standout that sounds like a more rave oriented version of Chrome or Pressurehed. An outstanding set of space rocking, alien raving, Goth, progressive rock and electro dance fun. Recommended. For more information you can visit the Flesh-Resonance web site at: http://www.fleshresonance.com. Contact via snail mail c/o Flesh-Resonance; 141 Mark Rake; Bromborough; Wirral; CH62 2DL; UK.